Video footage has surfaced of Humanist Dr. Sikivu Hutchison once again slamming Comedian Steve Harvey’s derogatory comments towards atheists. Dr. Hutchinson has had Harvey in her sights before, this is not new. Recently an organization she founded in Los Angeles, The Black Skeptics Group, targeted Harvey in a promotional ad. 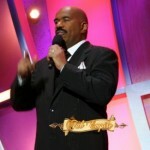 It is not known yet if Steve Harvey has reacted to Hutchinson’s attacks. What sets these shots apart is they were delivered at the Atheist Alliance International 2009 Fall convention. The Black Skeptics Group meets in Los Angeles to provide all races of people (though dedicated to African Americans) with an outlet to express their religious stories and questions. The Group is planning an event of its own: Going Godless In The Black Community (An Open Dialogue On Living Morally And Happily Without Religion) on November 7 in Los Angeles, Ca.